Billabong has a huge sail locker. I was pulling stuff out a couple months ago and found a compact blue sail bag. To my surprise there was an asymmetrical sail all ready to fly inside of it! Went out with my buddy David and we tossed it up to see how she was. Sail is still in great shape and flies pretty. We left Shilshole with a Northerly and scooted across the sound quite well with just a whisper of wind. The wind built and we just kept speeding up. 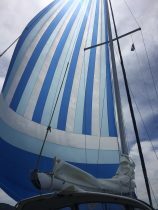 David had never flown a spinnaker before and he did a great job of learning to dance with the spinnaker and make the boat fly downwind. Race: Ballard Cup Series II Race 3. 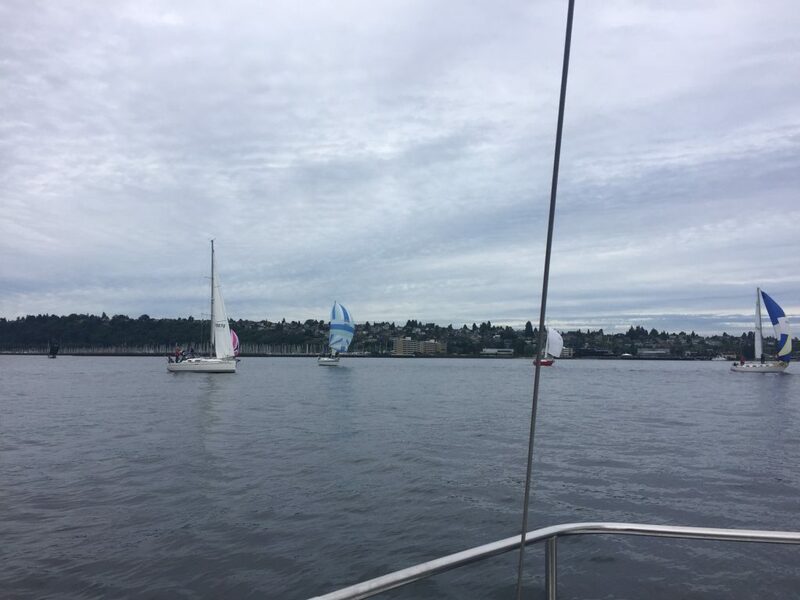 We had an interesting downwind start for this race right into a strong ebb. From the start line we had to fight our way down to the B mark against the ebb. Typically when doing this you want to stay near the marina breakwater to get out of the current as much as possible and that is exactly what we intended to do. After Figaro forced us to gybe. At the start we gybed onto a port reach and smartly crossed the start line headed right into the breakwater. Figaro and Blue Lullaby started on the other end of the line on starboard which gave them right of way over us (No idea where the rest of our class was). We were scooting along well when Figaro (who had ultimate right of way) decided to bring Blue Lullaby up and force us to gybe over again to avoid a collision. We executed it cleanly and accelerated away from Blue Lullaby. Once we were far enough ahead of Blue Lullaby we turned down and went wing-on-wing. Figaro stayed on a reach and we scooted past and beat her around the first mark. On the upwind leg our mark was the Meadow Point buoy. With the tide now at our back and the wind picking up we streaked out on a long starboard tack. Our strategy was to head out till we could turn and come back in on a single tack just about the time the tide turned slack. We had a bit of a snafu near the mark with another boat fouling one and nearly fouling us which allowed Figaro to sneak ahead. 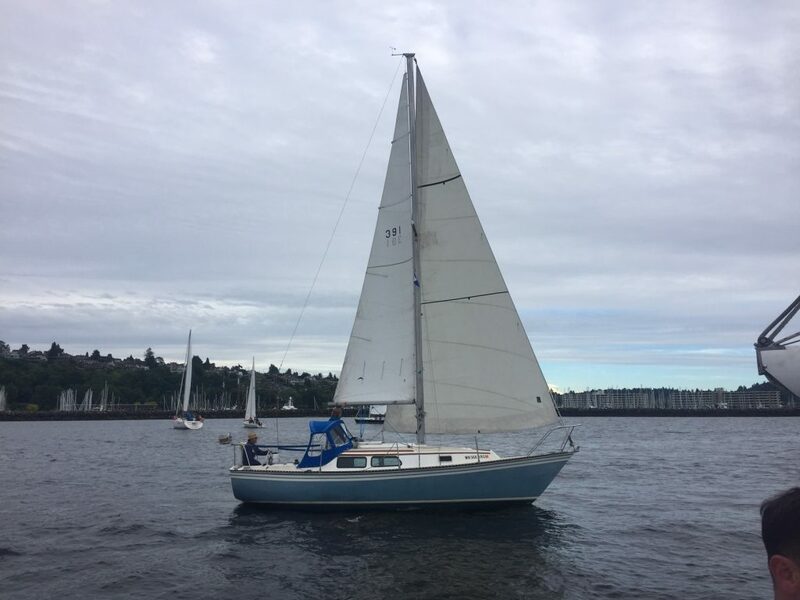 We caught her and passed her a few minutes later when she tacked into shore way too early. Possibly trying to stay closer in for the tide, but with slack coming up we were not concerned about it pushing us away from the mark. When we tacked in our fleet was far behind us. As we got within a couple hundred feet of the mark the wind got light and shifty. A big header pushed us down away from the mark and we had to tack up to get back. After rounding M we needed to head back to B. 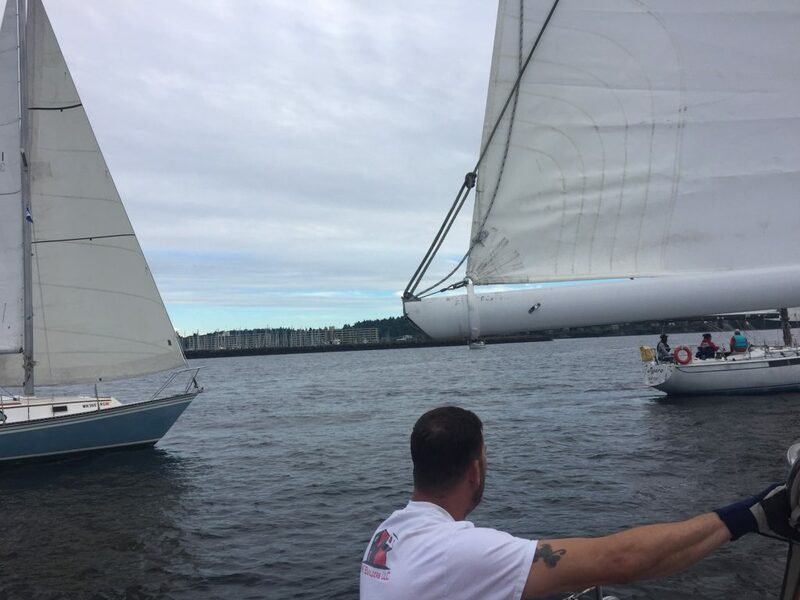 The plan was to hit the breakwater and gybe around behind the committee boat. We shot inside and the wind died… We were far enough out front that the rest of the fleet saw what happened and stayed outside. The wind filled outside first… We gybed over and struggled to make our way back out. That allowed Figaro and Blue Lullaby the opportunity to stay in the wind and sneak by. Womp womp. The committee boat pulled anchor and reset the finish line at the B mark. 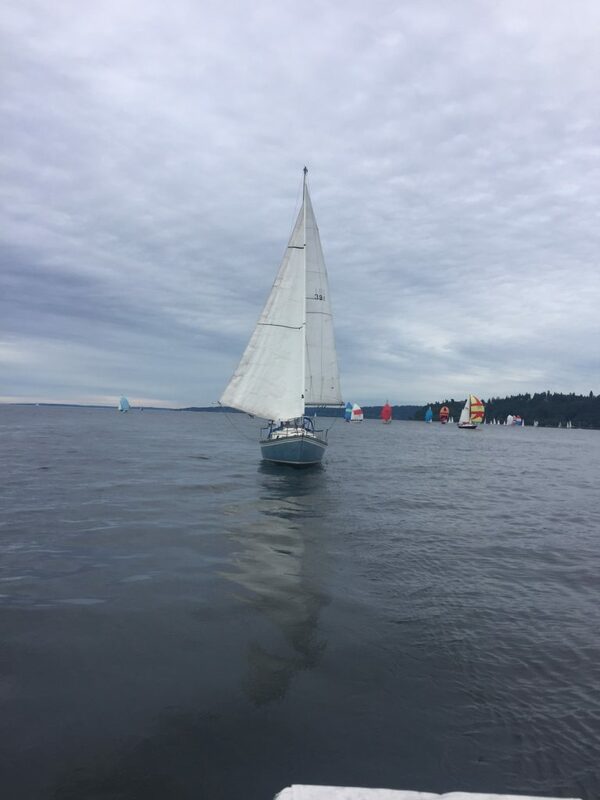 We nearly caught Figaro again when our wind died and Figaro was able to slowly float across the finish line. Blue Lullaby as well. Because Billabong owes both boats time the best we could hope for was 3rd place after the corrections and that is what we got. Our real time behind Figaro was 9 minutes as we slowly bobbed our away across the line, 14 minutes corrected time. Overall we had a good race. If the wind had not died on us inside I have no doubt we would have crossed the line first in our class. I think corrected time would have put us 2nd behind Figaro. We had a couple snafus with getting the headsail around and in that lost us time but the crew is learning! As I improve in tactics, boat handling, and ability to direct the crew we are gonna start smashing the competition way (Until Breeze shows up again…)!